If the quiet nighttime streets in Segovia’s medieval heart are anything to go by, most people seem to visit this magnificent town on day trips from Madrid. 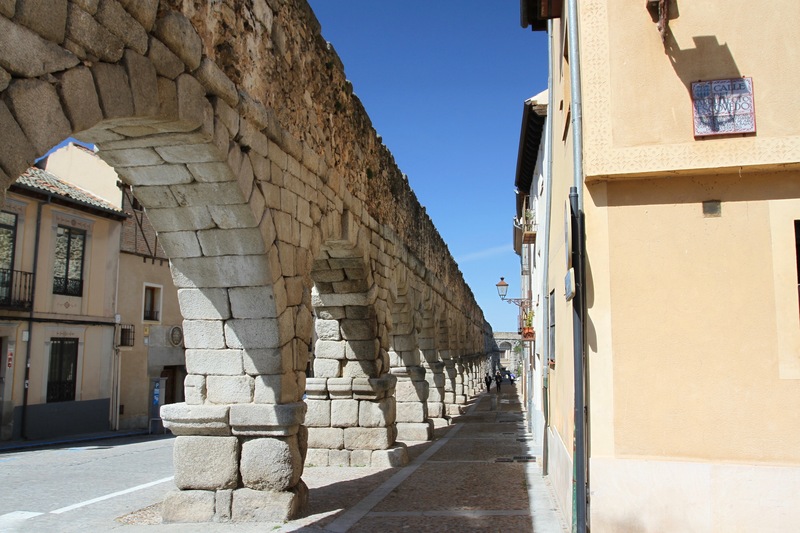 During the day the streets buzz with activity, and tour groups crowd into the 12th century Alcázar, around the square beneath the monumental aqueduct, and through the narrow lanes that connect the two. At night though, the town has a different personality, the streets empty and the sound of footsteps on cobbles can be heard echoing in alleyways. I’m glad we spent a night here, it allowed us to get a sense of the rhythm of life in the town. 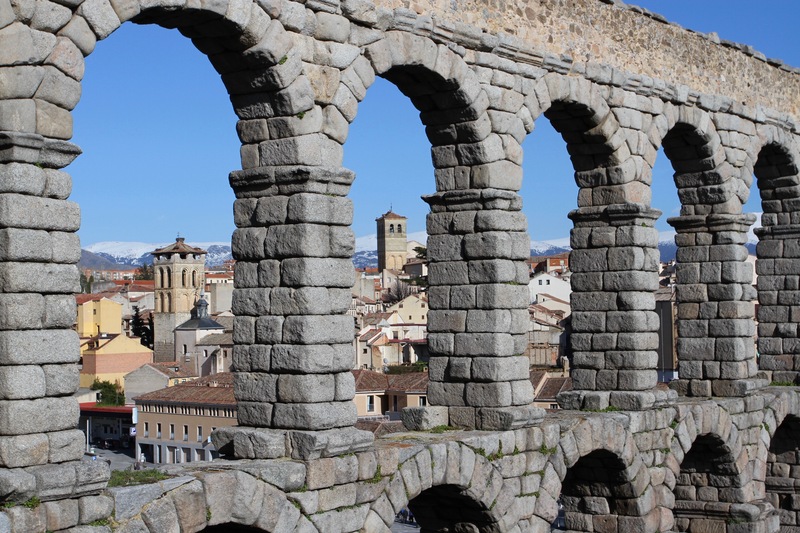 Perched high on a rocky outcrop and surrounded by walls and medieval gates, Segovia is an historic gem. By the time the Romans arrived around 80 BC, there had already been a settlement here for 700 years. 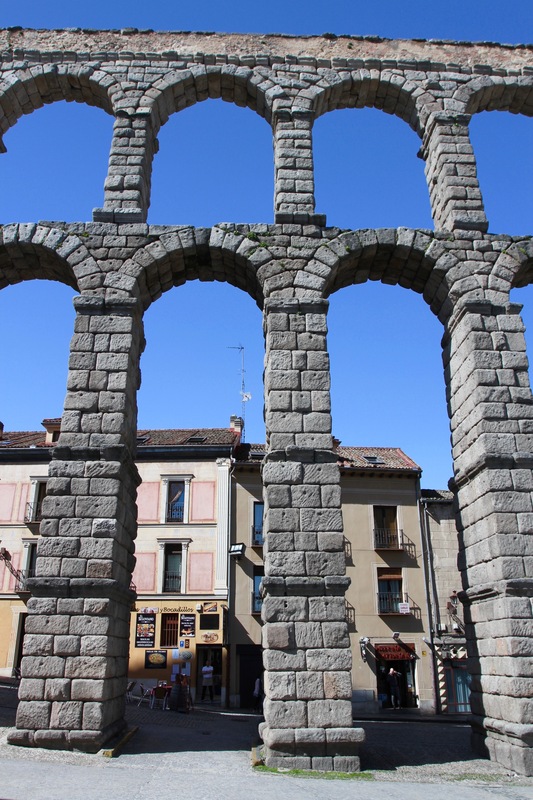 When the Roman Empire disintegrated in the 5th century, they left behind the extraordinary aqueduct that is still the most impressive feature of the town. 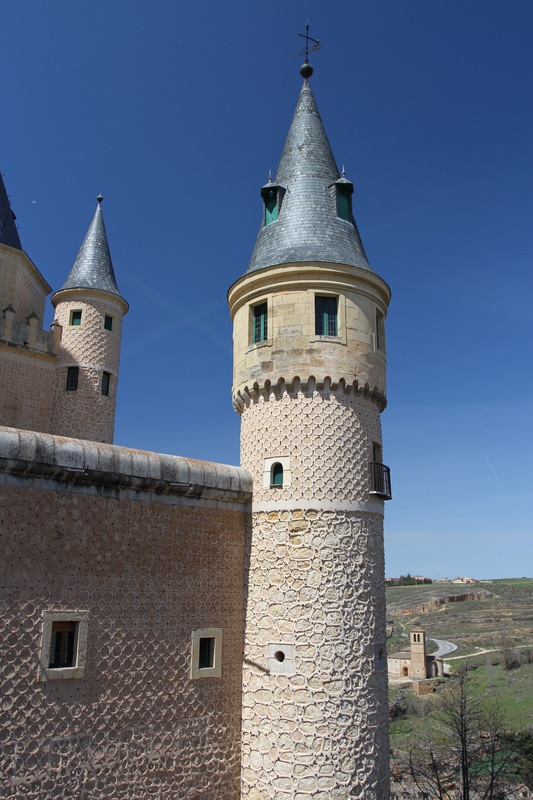 Moorish invaders captured Segovia in the early 8th century, ushering in three hundred years of Islamic rule. 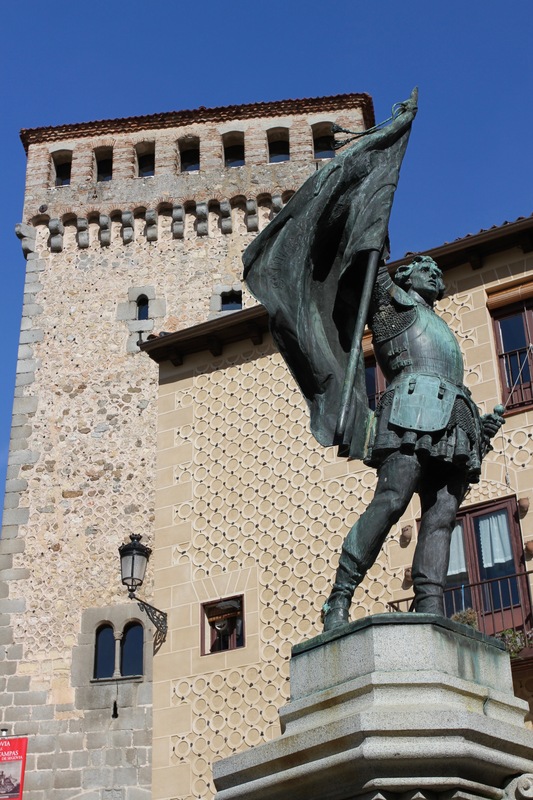 It was recaptured by Alfonso VI of León and Castile in 1079, part of the centuries-long Reconquista of the Iberian Peninsular. 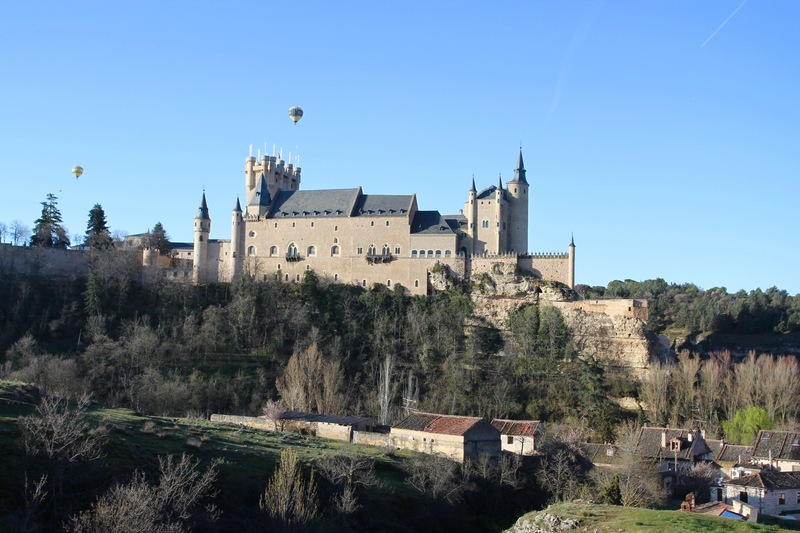 It was shortly after this that Segovia’s other major attraction, the Alcázar, was built over the original Moorish fort, which in turn had been built on top of the Roman fort. 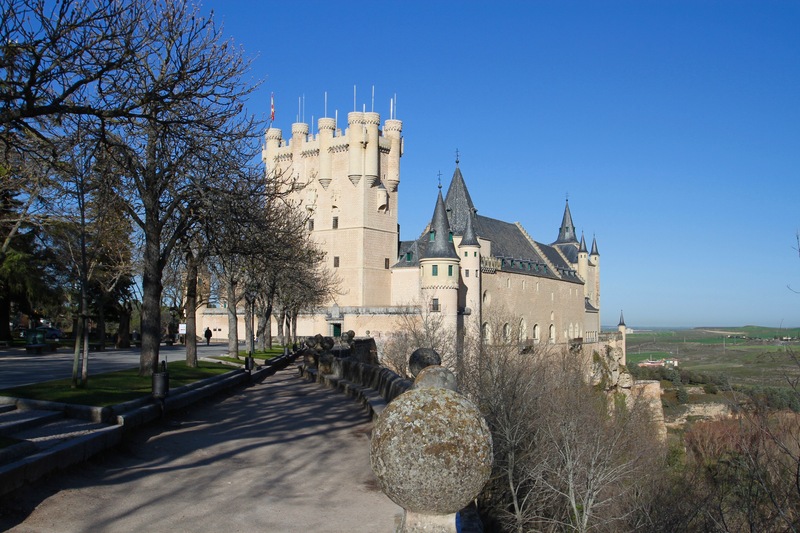 It was to become one of the principle royal residences of Castile. The Alcázar was the site of one of Spain’s foundational moments in 1474, when Queen Isabella I was proclaimed Queen of Castile. She would go on to marry Ferdinand II of Aragon, uniting Spain’s Christian kingdoms politically. Together they completed the reconquest of Spain from the Moors, and then commissioned Christopher Columbus to discover the Americas. The slightly odd Central European spires that adorn the Alcázar today, were added by King Philip II when he married Anna of Austria. Presumably to make her feel more at home. 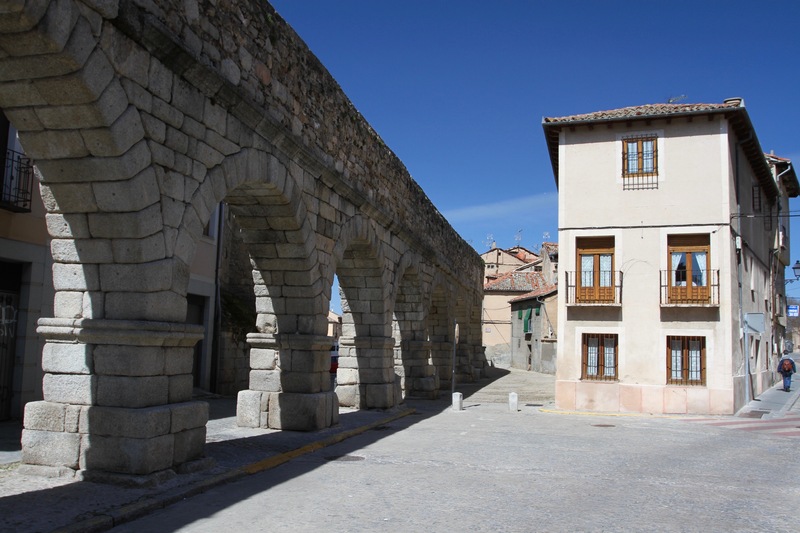 We started our day with a walk through the quiet streets to the Plaza Azoguejo, over which towers the 28.5 metre high aqueduct. It truly is an amazing sight, not to mention an incredible feat of engineering. 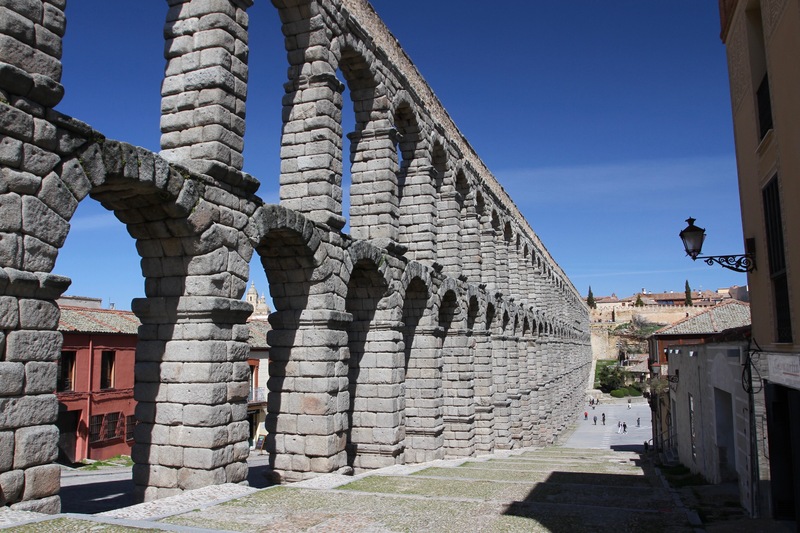 The whole thing stretched for 16km, delivering water from the River Frío into the heart of Segovia, and didn’t use any mortar or cement. We walked under the main arches of the aqueduct and then turned up some steps to follow the route it takes through the town. It’s majestic and a little surreal, people’s houses co-exist ‘cheek by jowl’ with the arches as the aqueduct cuts through sleepy neighbourhoods. We strolled the full length of the remaining structure before wandering back downhill to the historic centre. 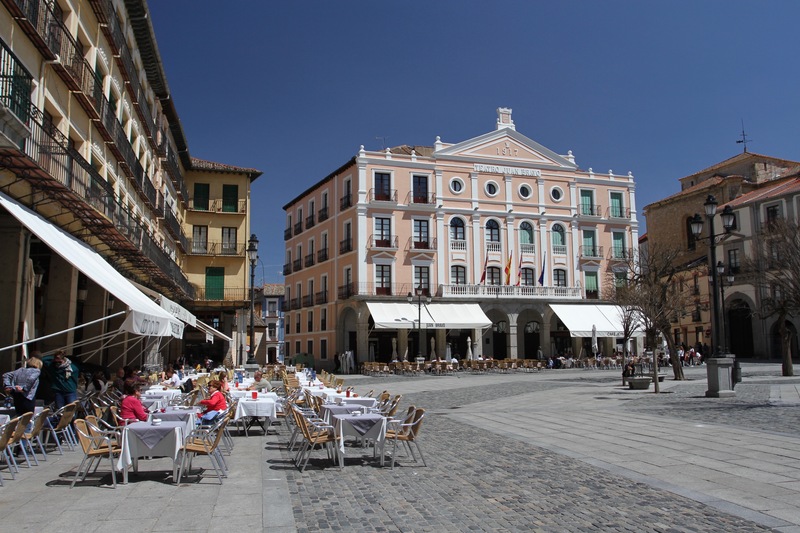 We popped into the Mesón de Cándido, one of the town’s most famous restaurants, for a drink and then headed back through the town towards the Alcázar. Things were busier now, with plenty of tour groups milling around, but it’s fairly easy to lose the crowds if you avoid the main streets. The Alcázar is a fantastical building, all narrow towers and pointy turrets, which is said (probably wrongly) to have been the model for the original Disneyland castle. We went to buy our tickets and the man behind the counter asked if we were European Union citizens. “Yes”, we said, “from the UK.” He gave us a pitying smile and said, “It’s free for EU citizens, but not for you for much longer.” Yet another reminder of the loss every British person will suffer when Brexit happens. Inside, the Alcázar is just as fantastical. The Hall of the Galley and Hall of the Kings, both have the most extraordinary ceilings, decorated with gold leaf and images of Kings and Queens past. We made our way around the building until we emerged into the sunlight outside the armoury. The views were spectacular, and it really gave us a clear idea of how the Alcázar is constructed on a cliff edge. All that history had given us an appetite, so we wandered back through the town to the Plaza Mayor for another tour around the tapas bars. Our first sighting of Segovia was glorious. The magnificent city skyline, framed by the snow covered Sierra de Guadarrama, was breathtaking. Close up, the town becomes even more exquisite. 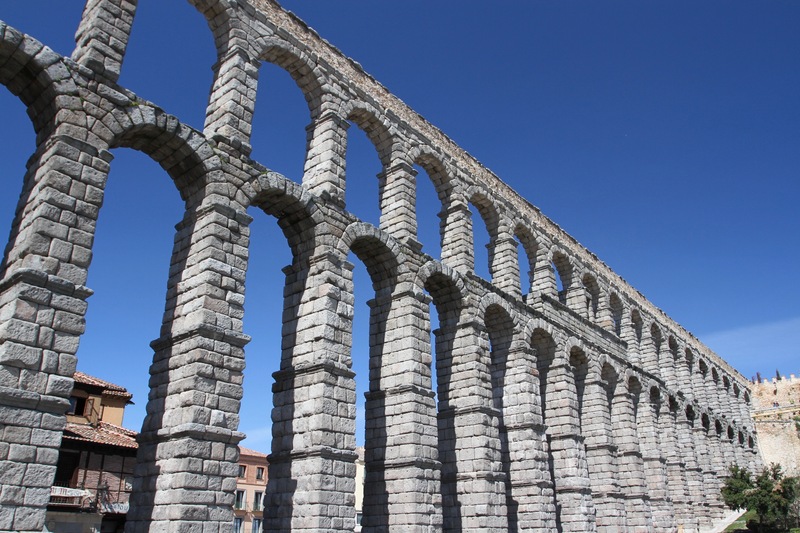 As we drove into the centre in an attempt to find our hotel, we passed the ridiculously dramatic Acueducto de Segovia, a perfectly preserved Roman aqueduct that was built in the 1st Century AD, and has survived intact for close to 2,000 years. It’s an awe inspiring sight, that put me in mind of the Roman city of Jerash in modern-day Jordan. 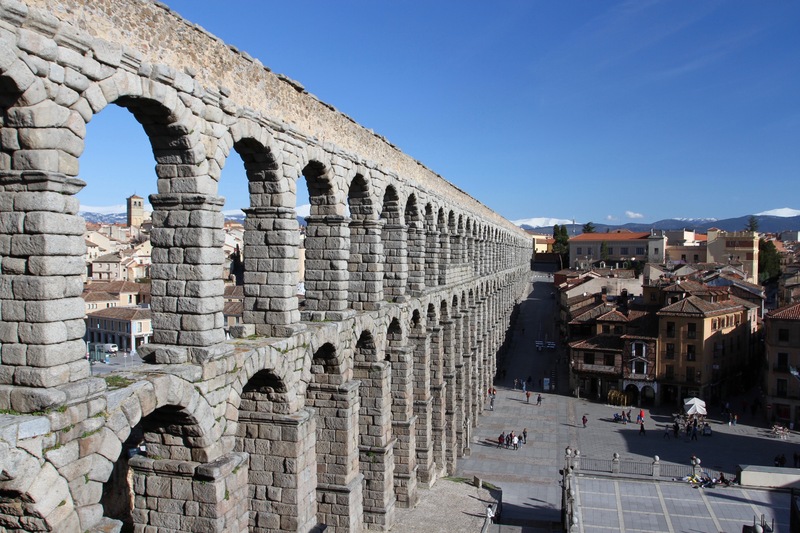 If a 2,000 year-old aqueduct was the only reason to come to Segovia, it would be more than enough. But this town of fewer than sixty thousand people, punches well above its weight in many other ways. 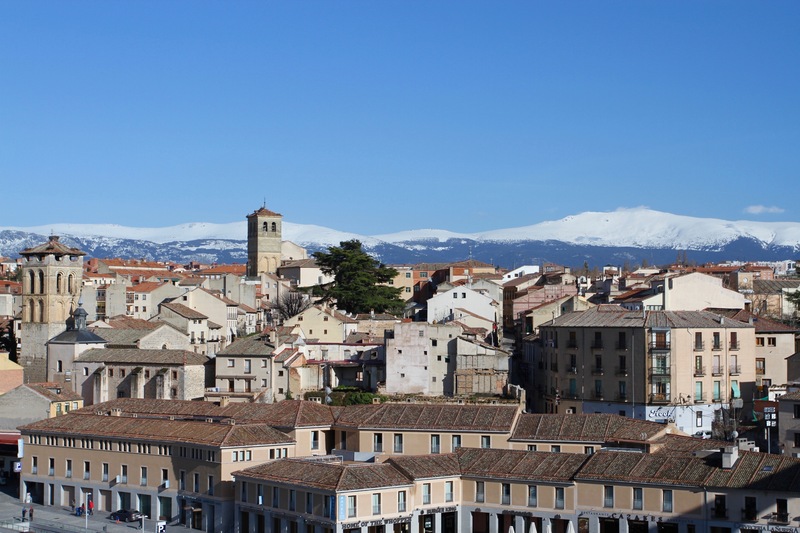 The whole of the medieval old town is an UNESCO World Heritage site. 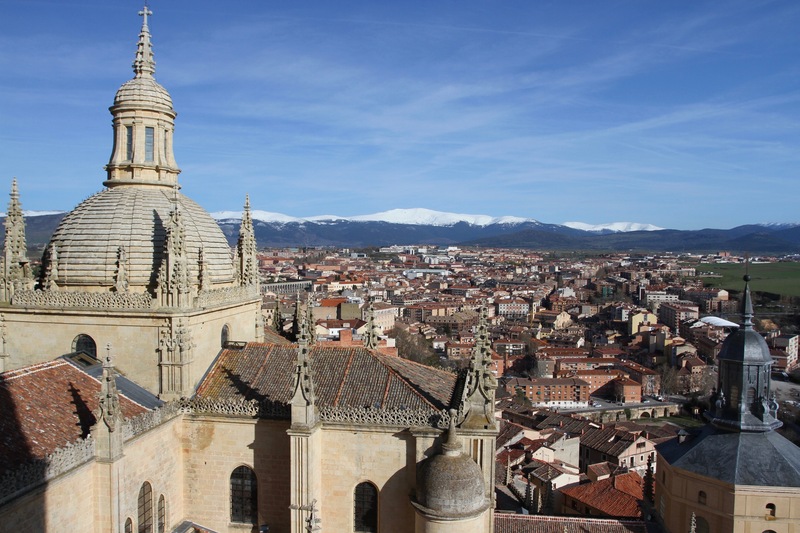 Segovia is a place that perfectly embodies the history of Roman, Moorish and Christian Spain, and the grandeur of the country’s Golden Age, beginning with the Reconquista and encompassing the discovery and conquest of the New World. Walking the streets of the ancient centre between the turreted 11th century Alcázar, the 16th century Gothic cathedral and the 1st century aqueduct, is a little like being in an open air museum, only one with far more life. 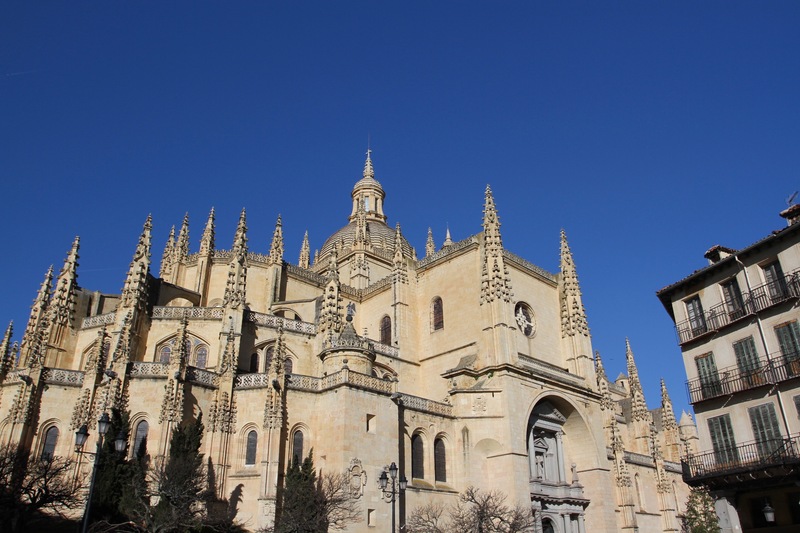 Despite its many historic monuments, Segovia during the day is a vibrant place with pleasant squares where families gather, and narrow winding cobbled streets that ring with the sound of voices. At night it was much quieter, the action transferred indoors to a selection of excellent tapas bars and even better restaurants. 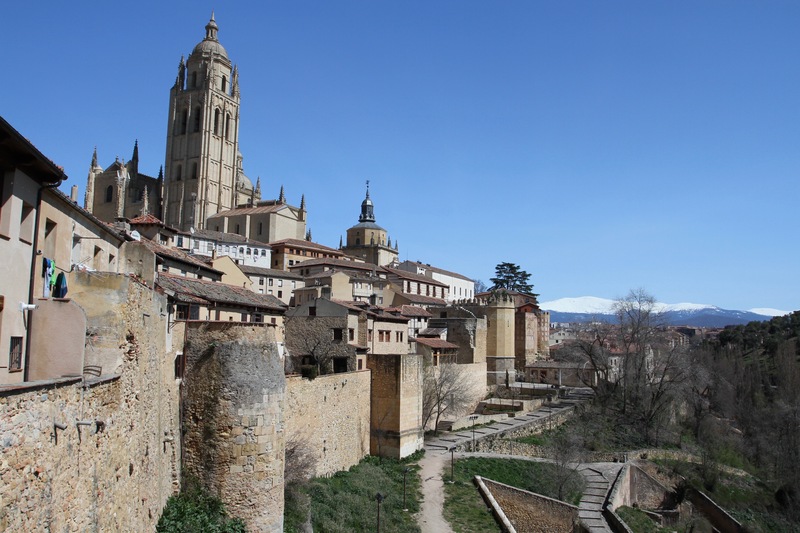 Segovia is a weekend destination for Madrileños, and has fabulous places to eat its legendary food. This is the home of the cochinillo asado, or roast suckling pig, served with head and feet, and ‘carved’ using a plate. 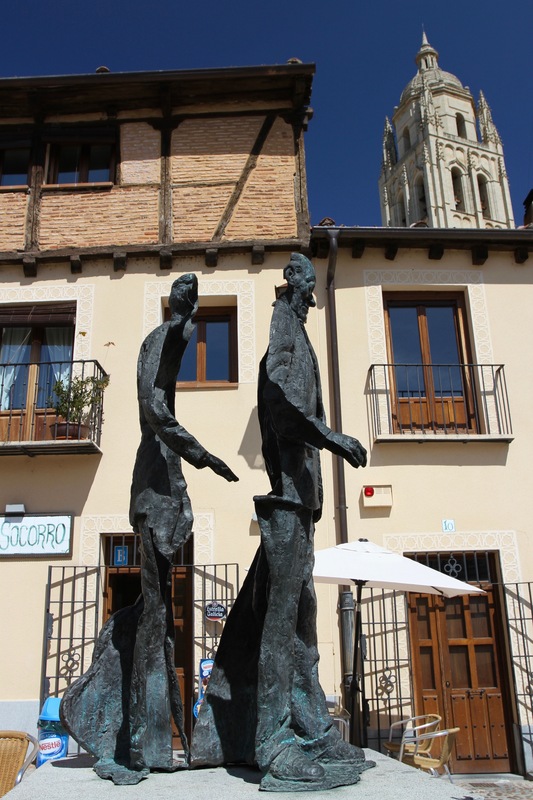 Not sure why, but that’s the way they do it in Segovia. Even more special though is the cordero lechazo asado, or the roasted leg of lamb. We ate this dish at La Concepción in the Plaza Mayor and it was truly delicious – they also do the finest carajillo I’ve ever had in Spain. Nobody comes to Segovia to lose weight apparently. We were staying in the Hotel Convento Capuchinos, a former monastery and church that date from 1637. It was a fittingly historic place to spend the night and had views over the Río Eresma and valley below, including the 13th century Templar church of Vera Cruz. Built not long after the city had been captured from the Moors in 1079, it’s modelled on the Church of the Holy Sepulchre in Jerusalem. 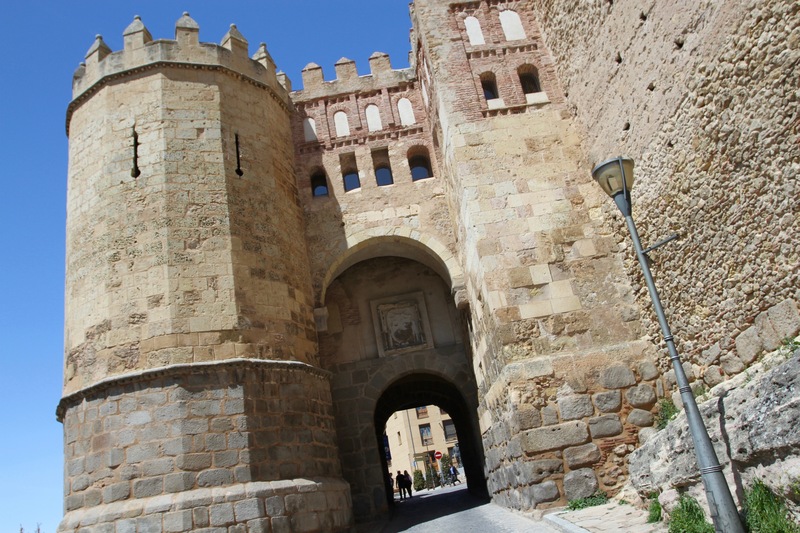 We’d arrived in the late afternoon and once we’d found somewhere to park – always a challenge in medieval Spanish towns – we checked in and set off to unearth a tapas bar or two. Luckily for us, that is not difficult. 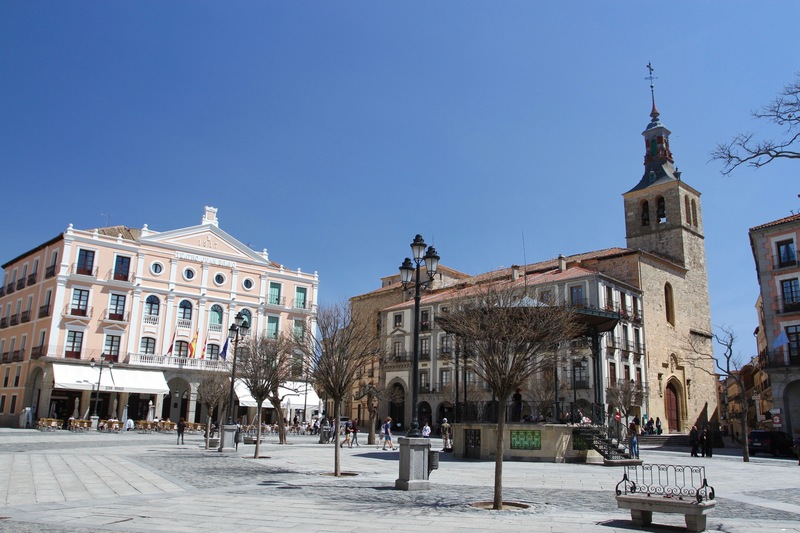 The Plaza Mayor, which is dominated by the cathedral, has several good options running around the outside of the square. We started in one corner and worked our way around, stopping at places that looked good or had a crowd. We weren’t disappointed. Afterwards, we were just in time to clamber up the bell tower of the cathedral before it closed. The views were magnificent, the whole town was laid out before us, as were the same snow capped mountains that we’d driven through to get here. 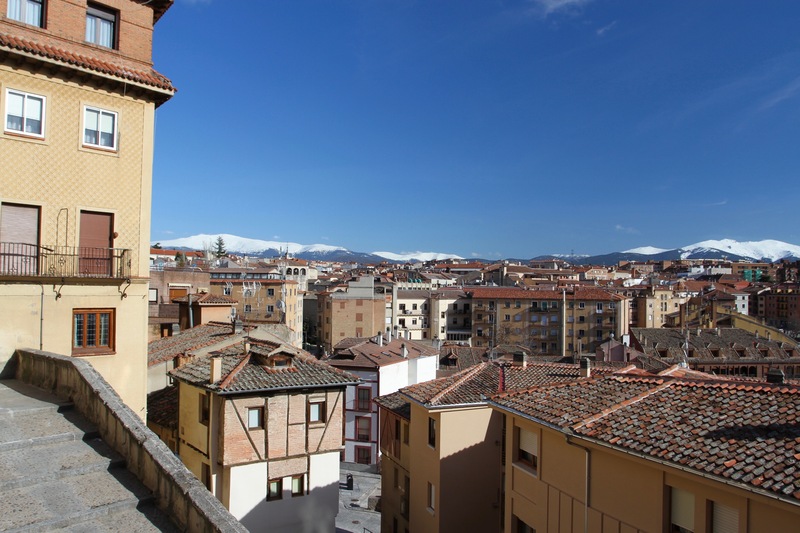 From our vantage point we planned the next day’s excitement and then went to see if we could book a table for dinner at one of Segovia’s most popular restaurants, Restaurante José María. The cochinillo asado was calling to us.